This inspiration for these actually began months ago on a trip to Italy (weird, eh?). My husband, the insatiable coffee drinker, mentioned how nice it would be to have these cookies kicking around the pantry from time to time, as he would get one on the side of every espresso order and loved the combination of smooth, rich coffee and sweet, crunchy nibbles. I thought I would indulge him when we returned but I was disappointed to discover a severe lack of vegan recipes, as eggs play a major role in the traditional version. I put the idea on the back burner until recently, when I baked something at work using applesauce instead of eggs. It worked perfectly. 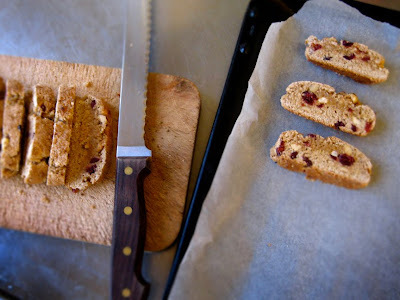 The cantuccini spark was reignited and now we do have these kicking around in the pantry, much to our delight. Let’s be up front: I got nothin’ against eggs. However, I am forever curious about finding substitutes for certain ingredients as I have to cater to vegan diets, or food allergies, or the weight-conscious, at the restaurants I work. Substituting eggs is a slightly tricky matter in baking, as eggs take on different roles depending on what you’re making. In a cake, for example, the eggs serve as a leavening agent, helping to make the cake light and fluffy. In baked goods such as cookies and muffins, the eggs add moisture and act as a binder, gluing all the other ingredients together. In this case of cantuccini, applesauce is a great choice because it’s naturally sweet and it will act as the necessary “glue”. The baking soda is in included to help leaven the dough, as the cookies would be rather flat otherwise. To replace the eggs in this cookie recipes, simply use ¼ cup applesauce per egg. 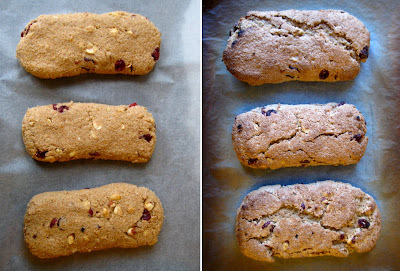 This type of cantuccini recipe typically calls for 3 eggs, so I have substituted them ¾ cup of applesauce. 2. Line two cookie sheets with baking paper. 3. In a large bowl, whisk together the flours, baking powder, and salt. 4. In a medium bowl, whisk together the sugar, applesauce, oil (1 TBS for a hard biscotti, 2-3 TBS for a softer biscuit), and orange zest. 5. Stir the sugar mixture into the flour mixture, add the nuts; finish mixing with your hands. 7. Place these on the cookie sheets. 9. Remove the pans and reduce the oven heat to 300°F. 10. Cool the logs on a rack for 15 minutes. 11. Cut the logs carefully with a sharp knife straight across into 1/2 inch wide slices. 15. Cool on racks, then store airtight for up to two weeks. If you’re really feeling naughty, dip one side of the cookie in high-quality dark chocolate. These cantuccini make a really nice gift for the holidays – take a batch to a party and watch them disappear into coffee cups and smiling faces. Or keep them kicking around your pantry – for a very short time. Oh yum what a perfect recipe to have with espresso coffee time break, wonderful to make for morning tea, thanks for the details. I particularly like the way you can mix it up by adding your own combo of variations, will be giving them a try. Hi Sarah – I know this is an older post but I was thinking of doing a pistachio and honey version;how would you adjust for the honey as a liquid? Hey Sarah, thanks for such an inspiring blog! I love it! Just a quick question…. how would you replace the spelt flour in this recipe for a gluten-free diet? Oh and one more question… which Cup sizes do you use in your recipes? Cananadien I suppose…. Sarah, thank you so much for sharing this fantastic recipe! I halved the quantity and made a chocolate/orange/hazelnut version. I used 1 cup spelt flour, 1/2 cup dutch cocoa powder, a pinch of salt, just under 3/4 cup coconut sugar, 1/2 of 3/4 cup applesauce (just under two smallish apples), 1.25-1.5 tbsp coconut oil, zest of 1 orange, 1 tsp vanilla paste, and 1/2 cup roasted and chopped hazelnuts. I baked them for 10 mins each side once cut (but might try it for 5 next time). They turned out perfectly and I will be taking them to family Christmas celebrations where I’m sure they will be well received. Can’t wait to try some other flavour variations. i will check back! your blog is wonderful – your recipes look amazing! Sarah, what are your thoughts on that “egg substitute” stuff that comes powdered in a box? those look divine – and i appreciate your use (and explanation) of non-dairy substitutes. i try to cook without eggs as much as possible – so far the hard part has been when trying to eliminate eggs in yeast breads – any advice?